In recent years, it has become increasingly difficult to identify counterfeit golf clubs, and BOOKOFF is working together with other major companies handling used golf clubs under the Counterfeit Goods Eradication Campaign to intensify countermeasures. Counterfeit golf clubs are a problem for the entire golf industry. The BOOKOFF Group provides and shares information regarding counterfeit goods through manuals and training sessions, and cooperates with other companies in the industry as we strive not only to eradicate counterfeit goods, but also to grow the overall market. 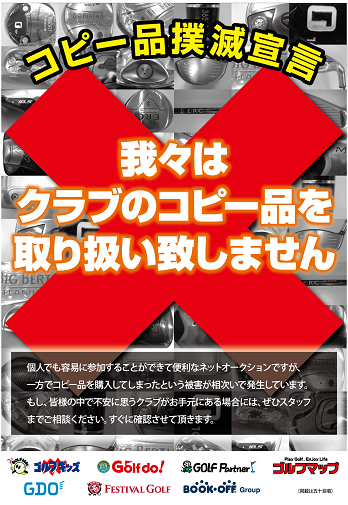 Posters are displayed at stores to gain the trust of customers and inform them of the potential risks related to various purchasing methods. Information on how to identify apparently authentic counterfeit goods that have been brought in to stores is shared with other companies. When a counterfeit item is brought into a store, head office divisions are immediately informed and send advisories to stores. Advisories are sent in the event of theft, to facilitate the smooth sharing of information among companies.